Tell me that you love cakes and we can be best friends! I am a cake lover and my favorite is the decadent German chocolate cake. And like some of you, I also have midnight cravings for rich and moist chocolate cake. At times like these I end up making a mug cake instead of going berserk with the fancy baking ingredients and tools. Thus, the mug cake has been making appearance every few days at our place. 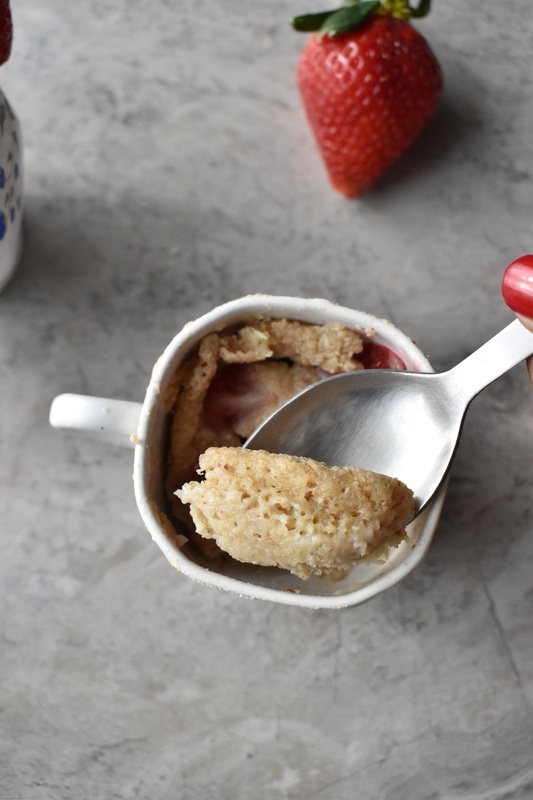 Cake made in a mug with minimum ingredients and quickly in a microwave is famously called Mug Cake. It takes something from 50 seconds to 2 mins to bake a mug cake in a microwave depending upon its wattage. So you don’t end up cooking in the kitchen for a long time. My husband and I have come terms to having a comfy stay at home V-day. We usually have our sweats on and drink some rum (I prefer orange juice :p ) eat cake and chatter non- stop about all the foolish things we have done as teenagers. 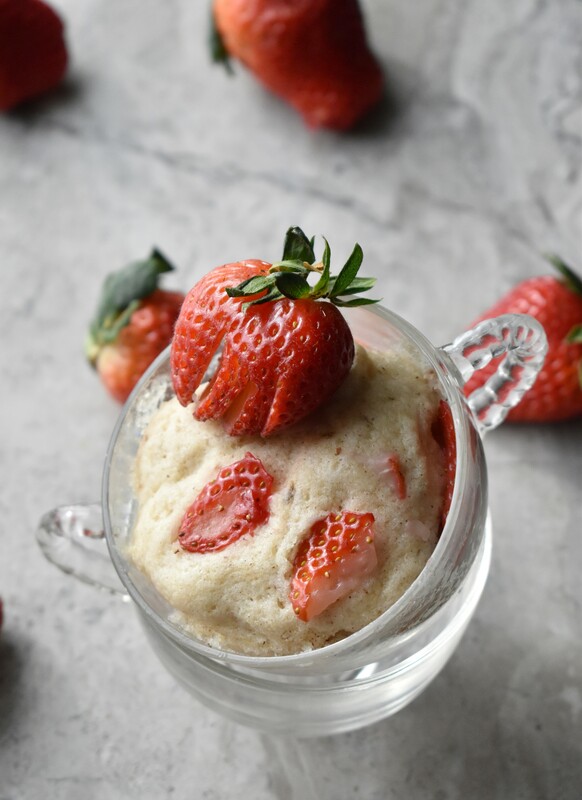 So this time around, I asked him what he wants and he immediately chimed – “Mugcakes” So here I am making some mugcakes but strawberry flavored because Valentine’s and strawberries are inter-related, don’t you agree? 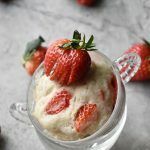 What’s new in mug cake? This recipe is eggless and gluten free. It can be made in 2 mins and enjoyed immediately. In a mixing bowl. add the flour and baking soda and cinnamon powder. 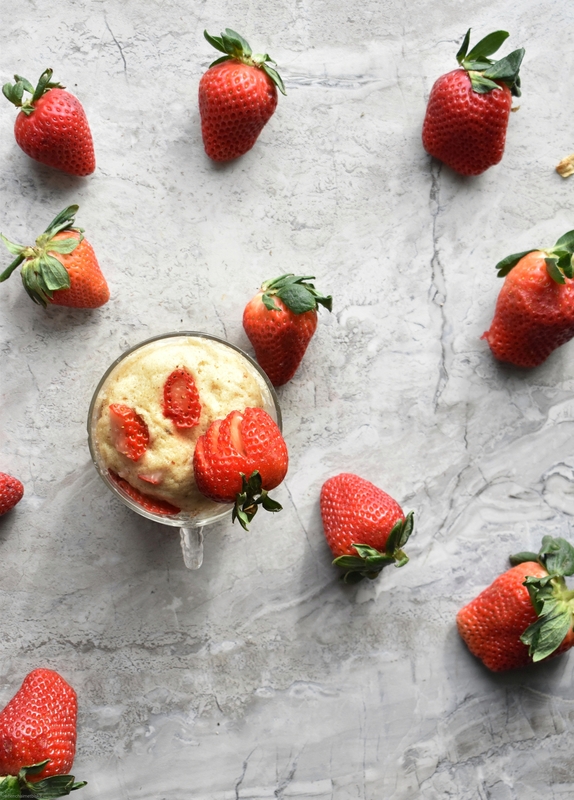 Add some chopped strawberries into the batter. To this add milk, oil and mix everything thoroughly. Pour it into the mug and microwave it for 1 min in intervals of 30 secs at full power. Check to see if the top is cooked,if not, microwave for intervals of 30 secs at power level-7 until the top is cooked. If you are using almond flour and oat flour, reduce the amount of oil by ½ tbsp. This recipe works best for medium sized mugs that are 12 ounces. You can also add strawberry puree. If doing so, reduce the amount of milk and oil by ½ tbsp. Experiment with Almond flour and oat flour blend.. I tried the almond flour and oat flour blend instead of the Gluten free flour blend. This cake turned out super moist and delicious. The overall texture was amazing. The mashed banana makes the cake moist and gooey. But you need to take care of the baking time in the microwave. If you keep it for more time, it might turn hard. 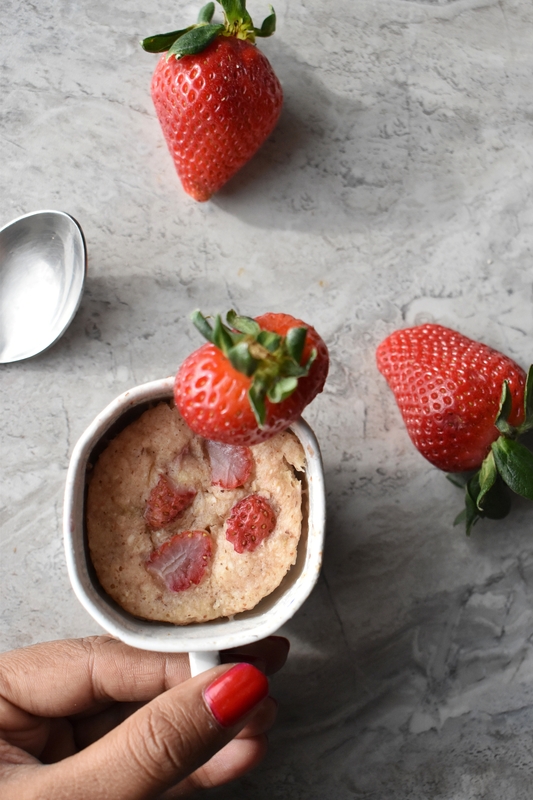 Valentine’s day looks pretty beautiful with this pretty Mug cakes. Happy Valentine’s day to all of you!